One of the decisions that users of reusable packaging must address is whether to rent, lease or purchase. The case for reusable container ownership is put forth below by Elvinco Technologies, reusable crate supplier to Netto, one of Scandinavia’s largest supermarket chains. With over 1,000 stores across Denmark, Sweden, Poland, Britain and Germany, Netto needed to re-examine their logistics system when their receiving bays were dealing with unmanageable volumes of empty corrugate boxes, trays and packaging materials. The logistics problem was that hundreds of suppliers were sending produce in hundreds of different containers which neither fitted well on pallets nor interstacked for efficient storage and handling. This discarded packaging was taking up valuable floor space. In initial discussions with Elvinco Technologies, Netto could see that the InterCrate plastic container has a nesting ratio of 4 to 1 when empty, therefore would effectively only take up a quarter of the space. This volume efficiency in itself, cleaned up the receiving bays and allowed for empties to be moved efficiently back to the distribution center or actual supplier. What appeared to be the largest issue with reusable containers, turned out to be the easiest one to resolve. The problem – who would manage the container logistics so that there would be no theft or loss? The most cost-effective solution evolved with Netto owning the containers in order to maximize savings and efficiencies for the container delivery and return cycle. Here’s how it worked – when Netto placed an order for produce, the supplier would have authorization to pickup the required number of containers from the distribution centre. This eliminated separate pickups as suppliers regularly delivered to the distribution centers. The supplier’s interest was to fill the containers with produce and deliver to Netto their completed order. With this system, all parties’ interests are aligned since the supplier needs to return the same number of containers to deliver the specified order. With Netto now having their own fleet of containers, it meant that suppliers no longer needed to carry the cost of the one-way corrugate boxes, and that hard cost saving was passed back to the supermarket. The containers were expected to be used 12 times a year, but in the first year they actually got the usage up to 20 times. The containers had paid for themselves in one year, and Elvinco guaranteed them to last 8 years. By 2005 Netto had a fleet of over 750,000 containers and they were saving 20 million corrugated trays a year from the landfill or re-pulping plants. At about one dollar a tray they were also saving $20 million a year, through price reduction from suppliers for no longer purchasing corrugate trays. With the incentive of increasing savings, usage has continued to go up as they add to their product range of items delivered in the containers and expand shipping distances across borders. An added bonus to solving this space issue, was better merchandising. The Intercrate keeps produce cooler longer with a sophisticated ventilation design, and the smooth walls do not trap dirt, ensuring the containers stay clean and look good. Now Netto’s produce is on display in the containers which are nicely matched by colour with the company logo on the side, improving brand exposure and giving that farm fresh look. Produce goes straight from the truck onto the floor in the containers which has saved significant labor costs and reduces shrink and human handling. Customers also have more access to produce, as packers are no longer spending so much time on the floor restocking. In North America there have been some efforts to use reusable containers, but they have mostly been by third party operators which takes the profit potential away from the supermarket. 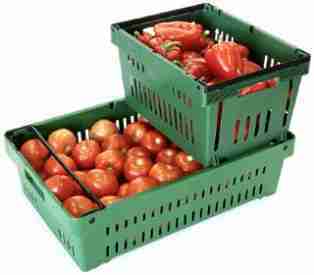 Suppliers of produce have been reluctant to send goods out in their own reusable trays for fear that they may not get them back. With ownership of the fleet of containers in the hands of the supermarket, not only is there no theft, but the containers pay for themselves quickly and the profit is then made by the supermarket. Mr. Flemming Elvin- Jensen is CEO of Elvinco, a company that has been designing innovative container solutions for three generations. “This is a great way for supermarkets to increase their efficiency of shipping and handling of produce while saving valuable storage space, reducing the corporate carbon footprint and adding to the bottom line,” said Mr. Elvin-Jensen. Elvinco has also changed the way Woolworths of South Africa receives their inventory, and made a significant impact on improving efficiencies at their distribution center as well as positively impacting their profits. “It takes innovation to shake up a process, but this is now a proven solution with some of the great supermarkets around the globe,” he concluded.